It’s an image which either makes you cringe in sympathy, or laugh uncontrollably. Either way, a Tesla Model S luxury sedan ‘parked’ nose first into a sign at Tesla’s Fremont factory tells a tale that we suspect the owner of the unlucky car — and perhaps Tesla too — would rather forget. And when we say ‘parked,’ we really mean ‘crashed,’ as the image below from Reddit user s1lentway shows. In a post made yesterday entitled “So I Went to the Tesla Dealership Today and This Happened…,” the unfortunate car is seen with its front fender crumpled, front and rear passenger side doors open, and the one proud Tesla Store & Delivery Center sign now doing a very good imitation of Pisa’s most famous landmark. 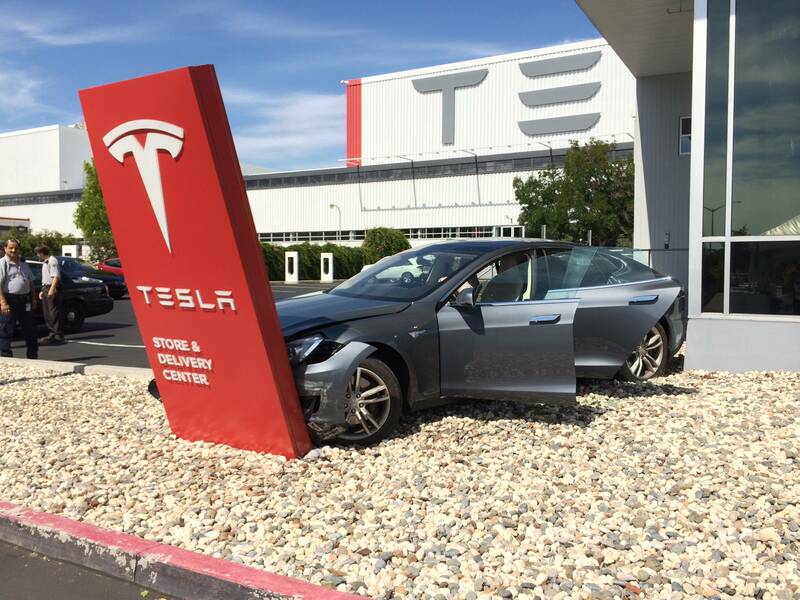 Nightmare from Fremont: brand new Tesla Model S meets company sign. On first glance, that appears to be exactly what’s happened. But look a little harder and as our eagle eyed Mark spotted, the car in question doesn’t look as perfectly pristine as a Tesla Model S fresh from the factory floor would look. Take in some more of the details, and a Californian white HOV-lane access decal can clearly be seen on the rear quarter panel closest to the camera. A decal which is only usually applied to a car after it’s been sold. Look even harder, and you’ll see some personal effects inside the car, telling us that the car most certainly isn’t new. As you might expect, there’s been a lot of heresay on the Internet surrounding the real cause of the crash. At the moment, we’re not sure what caused the crash or who was behind the wheel. But we’ve heard some pretty crazy explanations which seem to have a tenuous link to the truth at best. Since we haven’t been able to get to the bottom of this low-speed boo-boo, we’re going to leave other sites to carry on the speculation until we have some solid facts to back the story up. Whatever the cause, trying to explain to your insurance provider why your nice Model S got over-friendly with a large sign is going to be a tough one to explain. Still, it could be worse: at least the car won’t have to be trailered anywhere for repairs and the owner can rest assured parts supply — that bane of accident repair — won’t be a problem in this instance. It’s got us thinking though. We’ve all done silly things in our driving careers. I once managed to bottom out a Honda Prelude in a parking lot. But what’s your dirty driving secret, electric or otherwise? Share your stories in the Comments below. And if you happen to know what caused the crash, get in touch!